PT Krakatau Daya Listrik - KDL is a reputable company in Indonesia, running business in the field of generation and distribution of electricity power. Its business includ electrical power generation, oil and gas downstream business and electrical service business. PT Krakatau Daya Listrik is a strategic subsidiary company of state-owned steel producers PT Krakatau Steel (Persero) Tbk (Krakatau Steel Group). PT Krakatau Daya Listrik is 100% owned by Krakatau Steel Group. According to information found in the Company's website as cited by JobsCDC.com PT Krakatau Daya Listrik was first established in 1976 and initially started as a division unit under the Directorate of Planning of Krakatau Steel Group. After several changes of its status, the name of PT Krakatau Daya Listrik officially launched in 1996 and operates as an independent company. 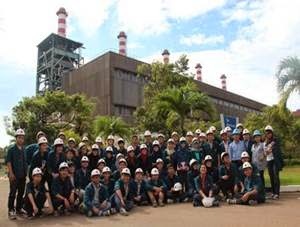 Headquartered in Cilegon Banten, PT Krakatau Daya Listrik now operates 400 MW of Steam-Generated Electricity Power Plant and 120 MW of Combined Cycle Electricity Power Plant. D3 : maximum age of 24 years old. S1 : maximum age of 26 years old. Education background in D3/S1 degree with minimum accreditation major "B". Electrical Engineering / Electric Power Engineering (Power Lines). Electronic / Instrumentation Engineering (Weak Flow). Mechanical Engineering / Energy Conversion. JobsCDC.com now available on android device. Download now on Google Play here. Please be aware of recruitment fraud. The entire stage of this selection process is free of charge. PT Krakatau Daya Listrik - D3, S1 Management Trainee KDL Krakatau Steel Group September 2018 will never ask for fees or upfront payments for any purposes during the recruitment process such as transportation and accommodation.